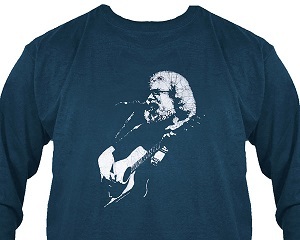 Jerry playing acoustic guitar is the front design of this batik style long sleeve t-shirt. The back of the t-shirt has the words "the breeze would stop to listen in...". Screen printed on an Indigo colored combed ring spun cotton shirt. Officially licensed by the Grateful Dead, and the estate of Jerry Garcia.